10 YEARS (100kg units), 5 YEARS (60kg units) and 2 YEARS (40kg units) ON MECHANICALS & 2 YEARS ON ELECTRICS. The warranty covers manufacturing faults & materials and is dependent on the dumbwaiter lift being serviced according to the manufacturer’s schedule and conditions. 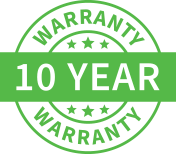 Dumbwaiters Australia products are covered by a nationwide warranty of up to 10 years for mechanical and 2 years for electrical. Conditions apply.